The Black Mist, White Rain speaking tour Melbourne session was held on Tuesday the 5th of April. 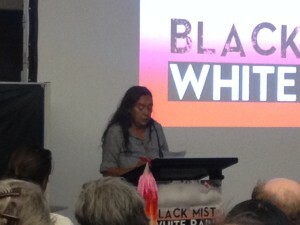 The event was coordinated by ICAN, and opened by Dr. Phoebe Wynn-Pope of the Australian Red Cross, with the Welcome to Country conducted by Vivian Malo. This quote from Sue Coleman Haseldine, anti-nuclear activist, nuclear test survivor, and elder of the Kokatha-Mula nation, captures the overwhelming message of hope and survival carried by the speakers of the Black Mist White Rain tour. Sue was one of three speakers taking part in the Melbourne leg of the tour. She was joined by Abacca Anjain-Madisson and Karina Lester. The speakers came from different nations, with different histories, but were brought together by their shared vision of a nuclear-free future. In every case, they shared their experiences as nuclear test survivors, along with those of their families, and their communities. The tour promised to be a great success. Already, at the time of writing, the speakers had presented to packed audiences in both Adelaide and Melbourne, and were continuing to Sydney and Brisbane. The ongoing relevance of the need to ban nuclear weapons was a key message of the night. Despite these bombs having been dropped half a century ago, the effects are still felt today on people’s land, their bodies, and down through the generations. Sue is a survivor of the infamous Maralinga nuclear tests that were carried out in secret by the British military in Maralinga, South Australia. Her perspective is long: she spoke not only spoke about the past, but also about the need to work actively towards the future. 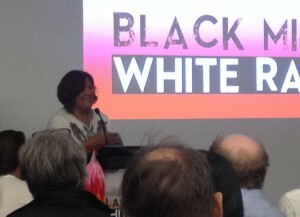 Sue spoke about culture, and her work in continuing her people’s identity by educating the younger generations. Karina Lester is a Yankunytjnatjara Ananou woman, co-manager of the Mobile Aboriginal Language Team at Adelaide University, and is the Chairperson of the Yankunytjatjara Native Title Aboriginal Corporation. She and her extended family are from Walatina in South Australia, close to the site of the “Emu field” nuclear tests. While holding her granddaughter in her arms, Karina spoke about the inter-generational nature of the effects of nuclear weapons. Through slides and photos she introduced us to her family of anti-nuclear activists. There is her father, Yami Lester, whose sight was taken following the “Emu field” detonation. 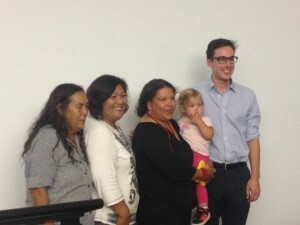 Her aunts and great aunts who battled the Australian government from 1998 to 2004 to save their community from becoming the site of a nuclear waste dump, a battle which they fortunately won. Finally, her daughter who travelled with her when she shared her people’s story at the World Nuclear Victims forum in Hiroshima. For Karina, as for all the speakers, it was clear that the effects of nuclear weapons are carried down through the generations. Poisoning of land, the resulting displacement of people, physical suffering, and the ongoing work to prevent further harm. Only years after her aunts’ success, Karina’s next battle began: in 2015 the Royal Commission into the Nuclear Fuel Cycle was called and has since listed 6 sites as possible dumping grounds, 3 of which are in South Australia. Abacca Anjain-Madisson comes from the archipelago of Rongelap in the Marshall Islands. Between 1946 and 1958 the United States tested 67 atomic bombs in this region. 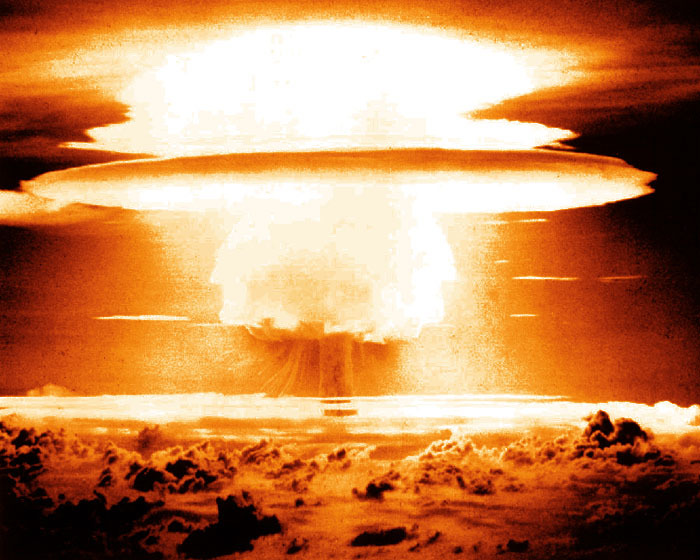 The largest was “Castle Bravo” which was a thousand times stronger than the bombs the United States dropped on Nagasaki and Hiroshima at the end of World War II. Abacca spoke of the secrecy with which the United States covered up the nuclear tests. This bomb would cement the US’s position as a superpower, and they wouldn’t let anyone prevent it from happening. Justifying their dehumanising plan “to use [her] people, [her] family, as guinea pigs” to test the effect the radioactive fallout would have on humans. “My family was considered subject matter, not human beings”. She spoke on the heartbreak for a community that had never before seen cancer and nuclear devastation. After the bombs were dropped, people were developing cancers and women were giving birth to babies like “monsters”. The Marshallese found that their language had no words that could describe the trauma, and had to create new words to even be able to discuss the damage done to the health and spirit of their people. Sue Coleman Haseldine advocating for all people to work together for a world free from the nuclear threat. While all speakers advocated strongly for working together and avoiding laying blame, the context of colonialist violence was important to recognise.Abacca introduced us to the tiny Marshall Islands by listing a long history of colonial powers that had claimed the archipelago. Including the United States, which had conquered the islands during World War II. It is hard to ignore that these bombs were dropped in the absence of any war or battle, and were dropped on people that the US hoped insignificant enough to avoid international uproar. 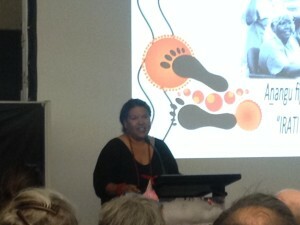 Throughout both Sue and Karina’s stories Terra Nullius and Australia’s history of colonisation hung in the air. It was not lost on Sue that it was in Aboriginal peoples’ backyard that the Australian and British governments saw fit for nuclear testing. Bombs were dropped on people who were denied basic rights, including the right to vote. By joining the anti-nuclear movement, Sue learned about the Marshall Islands and other peoples that had been the subjects of nuclear testing. She become aware of Australia’s further involvement in the nuclear weapons supply chain by way of exporting uranium. “To know that uranium from our country was devastating people in other countries broke my heart”. While it is clear that the United States, Britain, and Australia chose these communities for weapons testing because they regarded them as disempowered and disposable, these inspirational women and their communities have proven that they are formidable. They continue to survive, campaign, and carry on their culture. Speaking on the discussion panel at the end of the night, all three women affirmed the need for a comprehensive history of nuclear testing to be included in school curricula. This, as Sue put it, needs to be done “so that it never happens again”. In a tremendously courageous ‘David and Goliath’ style of move, the Marshall Islands is currently taking nine known or suspected nuclear powers to the International Court of Justice. The Marshallese argue that they are failing to disarm under the Nuclear Non-Proliferation Treaty. Abacca Anjain Maddison, proud of the Marshallese for taking nuclear powers to the International Court of Justice. With your help we can ban nuclear weapons for good. Visit the International Campagin to Abolish Nuclear Weapons to find out how.